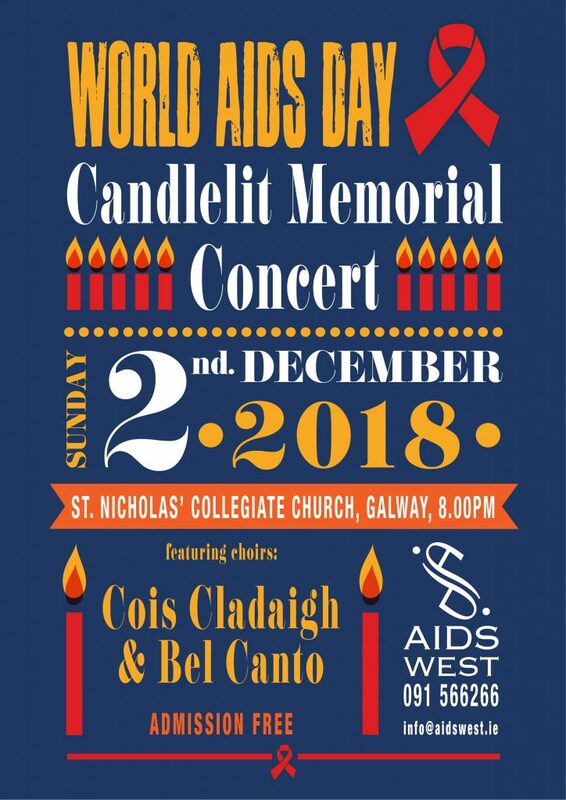 AIDS West is hosting a concert for World AIDS day. The concert will take place in St Nicholas’ Collegiate Church at 8pm on Sunday 2 December. Cois Cladaigh and Bel Canto will be performing at the event. The concert is open to all and admission is free. This year’s theme for World AIDS Day, which will be marking its 30th anniversary on 1 December, will be “Know Your Status”. Figures from the HSE Health Protection Surveillance Centre (HPSC) indicate that there has been an 11 per cent increase in the number of people in Ireland being newly diagnosed with HIV so far in 2018. These figures are of great concern to AIDS West. Manager of AIDS West, Joe McDonagh, says it is vital that people get tested for HIV. According to AIDS West, many barriers to HIV testing remain. Stigma and discrimination still deters people from taking a HIV test, and access to confidential HIV testing is still an issue of concern. Many people still only get tested after becoming ill and symptomatic. In an attempt to address these issues, AIDS West are expanding access to their Rapid HIV testing programme which will help people to know their HIV status by offering free community-based Rapid HIV testing. If you would like to find out more about the concert or speak to someone at AIDS West about booking a free Rapid HIV Test please call 091 566266, or email info@aidswest.ie for more information.